I have to admit that I have had my share of traumatic experiences trying to make veggie burgers. My efforts have often yielded tasteless blobs that crumble when I try to form them into patties. 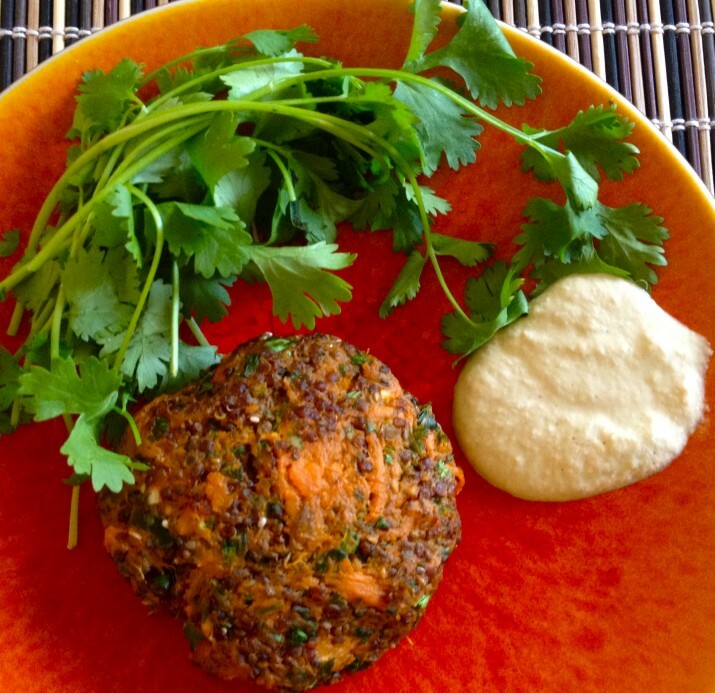 These vegan sweet potato quinoa burgers, however, transcend all of the veggie burger pitfalls. They are super moist, full of flavor, and stay together beautifully. So who is the mastermind of this awesome veggie burger recipe? Chef Marina Cook, the founder of Remedy, a San Diego based meal delivery service. Remedy delivers organic, restaurant quality meals for those using their services and happily accommodates those following special diets (like vegans!). To learn more about Remedy check out the website!! The first step is to prepare the red quinoa. Remember when you’re making quinoa, you want a 2:1 liquid to quinoa ratio. For more quinoa facts and tips on how to make light, fluffy quinoa click here. 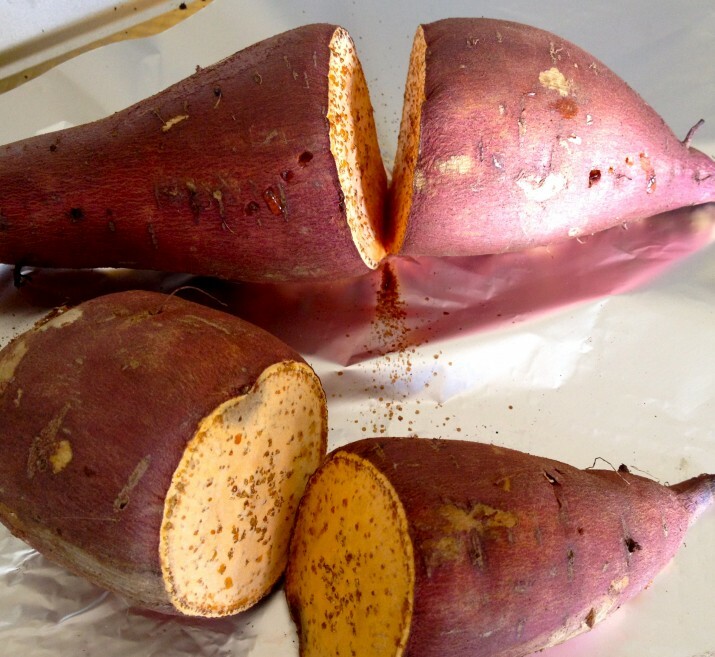 While you’re making the quinoa, you can move on to cooking the sweet potatoes. I broiled mine in the oven but you could also peel and boil them. When the sweet potatoes are tender, take them out of the oven. It’s easy to peel their skin off when they’re warm. And mix the quinoa and sweet potato together in a bowl. The spices and olive oil. Mix everything together, and you’re ready to make some veggie burger patties! Once you have formed the patties, place them on a greased cookie sheet and bake!! While the burgers are baking, you’ll have plenty of time to prepare the cashew sauce. Place the soaked cashews, roasted bell peppers, lemon juice and zest, and spices in the Vitamix and blend until smooth! You’ll end up with a smooth, creamy sauce that has a little spice to it! Place the sauce in the refrigerator until the burgers are ready to serve if you want the sauce to thicken up a bit. Be aware that that this recipe makes quite a bit of sauce. When I make it next, I think I will halve the recipe. Add cashews, lemon juice, roasted bell peppers, water, cumin, lemon zest, chili flakes, garlic, salt, and pepper to Vitamix.